*We recommend sitting on the floor with your back against the wall and placing a box 45” from the wall to determine if you will be comfortable in the Bluefin 14. What safety features does Pakayak have? There are two sealed bulkheads, fore and aft of cockpit, to ensure that the Pakayak stays afloat in the event that you swamp the cockpit. 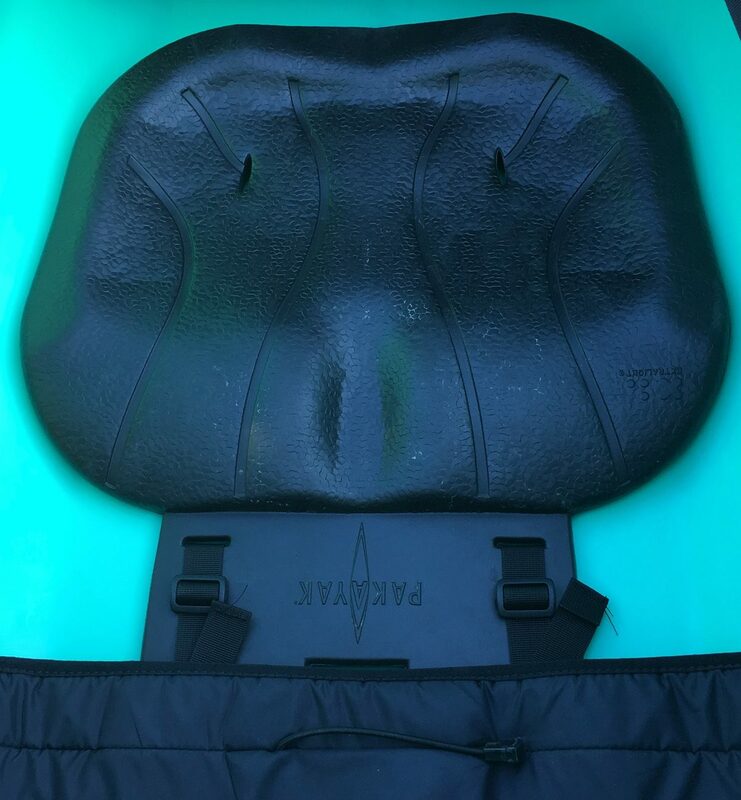 Pakayak also comes with reflective safety lines and watertight hatches. Are there deck lines or carrying handles? 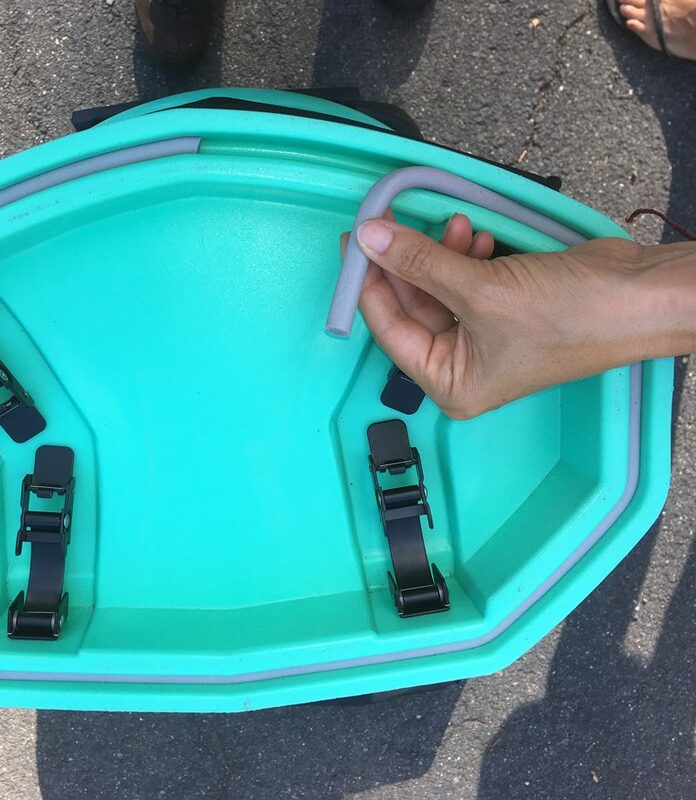 There are fore and aft carry handles, reflective safety lines along each side, and three areas shock cord for gear storage. See image above. 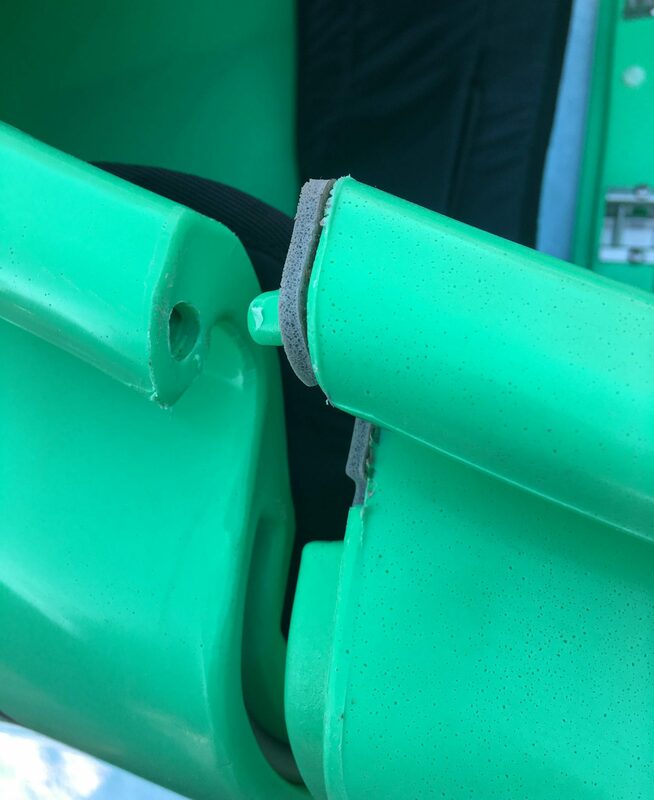 How are the sections held together? The tongue and groove connecting sections are designed to interlock and keep the watertight seal even in the event of an impact to the hull. We have tested our prototypes in temperatures from 30 degrees (Fahrenheit) to baking in the hot sun in the 90’s without any problem whatsoever. All of the latches and plates are made of either 316 stainless steel or steel coated with an enviro-coat which gives the same exposure resistance as the 316 stainless steel. 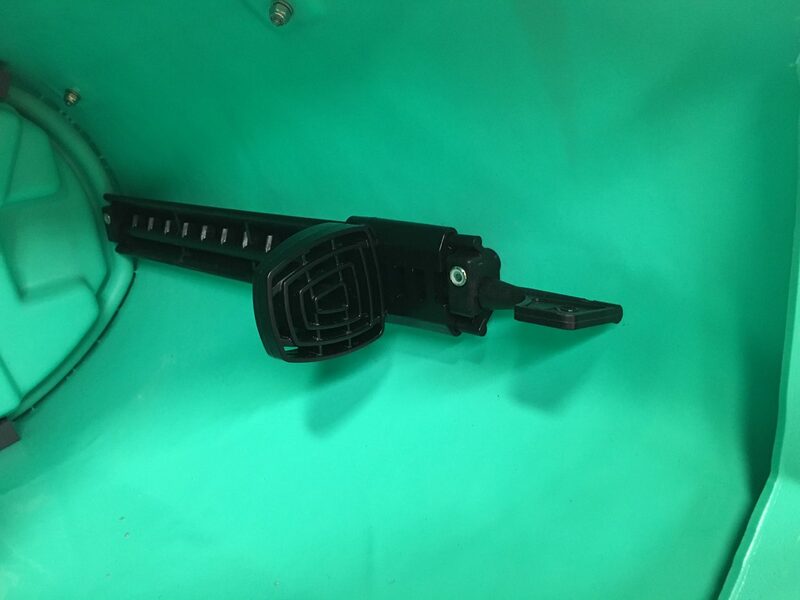 The band spring clamp design has been used successfully for decades in numerous applications without failure and is particularly good at handling vibration or impact such as collision with a rock as it is able to flex with the impact while holding its tension. Each clamp is rated at 300 pounds of holding force. With 5 clamps in the cockpit section, those sections are held together with 1,500 pounds of holding force. We have intentionally over-designed our clamps with respect to the forces that could be exerted upon them to ensure the durability of the Bluefin 14 and the safety of our customers. What about foot braces and rudder? The foot braces are flag style adjustable and can be used with a rudder. Bluefin 14 is rudder-ready so you can add one if you like. 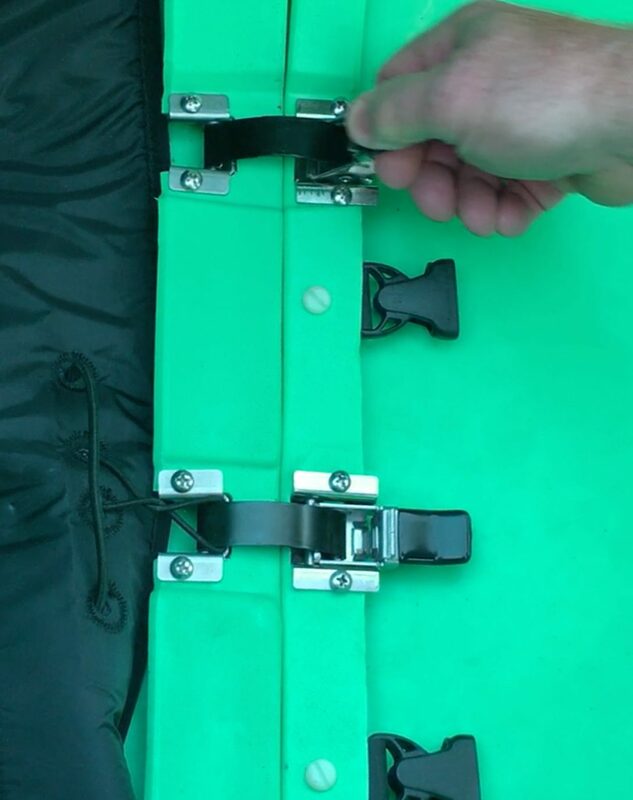 A universal rudder from Crack of Dawn Paddlesports or similar can be installed and used with the Pakayak foot braces as steering pedals. What are the hatch covers like and what size are they? There are two large watertight hatches. Hatch covers are 10″ x 17″ high performance rubber. The front hatch dry storage is 7000 cubic inches (115 liters), the rear hatch dry storage is 4000 cubic inches (65 liters), behind the seat storage is 2500 cubic inches (41 liters). What is the seat configuration? The seat is made from a new cutting-edge foam designed for kayak and rowing seats. The new material is quite comfortable. The seat back is band style and attached to the cockpit rim. What size spray skirt will fit? We have used a Snapdragon Ocean Trek extra large spray skirt and a Harmony 38-20 with our Pakayaks and both work perfectly. By using those sizes you will be able to convert to almost any brand on the market. Seals brand 1.7 will fit an OUTER rim length up to 36″ and an OUTER rim width up to 20 1/2″. We would urge you to determine what type of spray skirt best fits your needs and then try them on to determine the best fit around your mid section. The “tunnel” should be water-tight yet not restrict breathing while under exertion. Best to go try one on and see which fit/feel the best on you in terms of comfort. Can I “mount” and board it from behind like a traditional kayak? 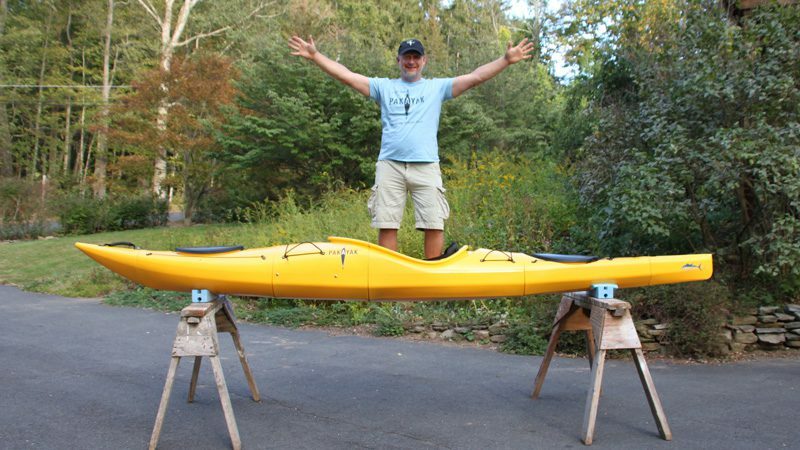 Yes, the Pakayak is identical to the one piece kayaks when assembled. It can be mounted solo in deep water from the stern, it can be rolled, and you will actually find it stiffer than the one piece versions as the connections act as reinforcing bulkheads. We offer a 24-month limited warranty on manufacturing defects. Here is our warranty policy. Is there a Serial # or Hull ID #? Yes. All of our boats have a US Coast Guard Approved Hull Identification Number which you will need to give us in the case of needing a replacement part. That number will contain all of the info we will need to trace your boat back to its production time, location, and mold. What’s the length from the back rest to the front bulkhead? Will I fit? The inside measurement of the cockpit opening is 18″ wide by 34″ long. Length from seat back to bulkhead is 45″. We have had many body types in the Pakayak Bluefin 14. Cort, who is in many of our videos, is 6’2″ with inseam length of 35″ and weighs around 190 pounds. He fits fine and loves paddling the boat. He is a surf ski paddler and also competes in OC racing (outrigger canoe – think Hawaii). He’s the one in the Eskimo roll video. Doug, the inventor, had our dog in his lap while paddling a few times, and combined, they are 240 pounds. At a demo, we had someone who was over 275 lbs in our boat – no problem. Here’s a tip to see if you will be comfortable in the Bluefin 14. Sit on the floor with your back against the wall and place a box 45” from the wall. How does it feel? Are your legs and feet happy? Of course not! Our Bluefin 14 comes with a leak-proof guarantee. There is a silicone foam gasket, which has the best rating available for exposure to UV radiation and salt water, at each of the connecting sections to keep it watertight. It does not take a compression set. In other words, it does not stay crushed but rather always returns to its original shape. The gasket is slightly oversized and pressed into a 1/4” wide channel at the bottom of the groove where it is protected from damage when the boat is in its disassembled state. If the gasket is damaged, it need only be plucked out with your fingers or a key, for instance, and replaced by pressing the new gasket in the groove. Once it’s clamped together the first time, it will not fall out. The gasket forms itself to the tongue creating a seal with a large surface area which can overcome minor contamination on the seal but in the event of extreme amounts of sand or dirt contaminating the seal, brushing it clean with a damp clean cloth or rinsing it with water will be all that’s required prior to clamping the sections together. We had our prototypes nearly buried in the sand and one quick dip in the ocean was all we needed to clean it before assembling. We include a towel on which you assemble the Pakayak and we recommend a vertical assembly which is the easiest and offers the least exposure to the sand or dirt. What happens if it hits a rock? 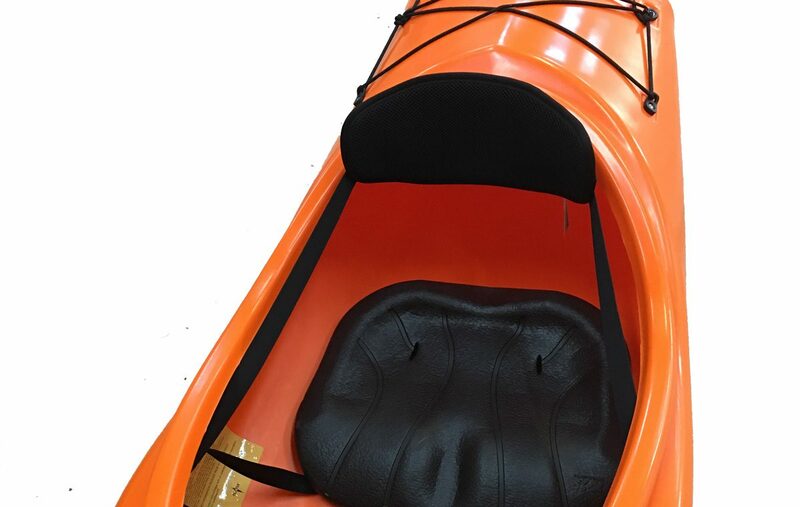 You can expect the same effect as you would experience in other top of the line rotational molded kayaks. If you hit a rock you most likely will bounce off. If you pin the boat against a rock with a large volume of water pushing against it (say, in large waves or river current), you will run the risk of crushing the thinner walled sections of the hull. 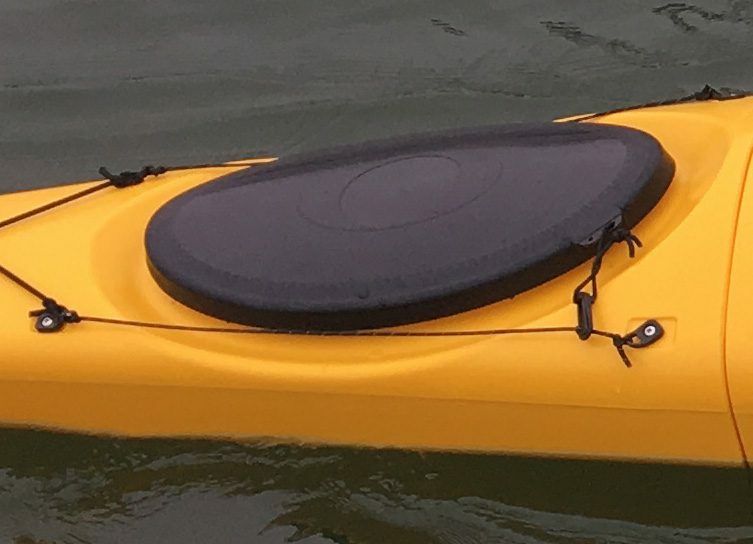 Although our Pakayak is designed to meet or exceed the performance of the current available sea kayaks, it is the paddler’s responsibility to make good decisions and stay within their abilities for their safety. Of course, you should always paddle responsibly, never paddle alone, wear your PFD, and follow all local laws and regulations.